It's week three of Veganuary, and time to shine some light on and share some love with another great vegan cookbook. This week I'm looking at Vegan Everyday , a weighty cookbook filled with vegan and gluten-free recipes from Toronto chef Doug McNish. Read on to enter to win this fab recipe collection. Today I'm sharing two of the 500 (500!) recipes featured in Vegan Everyday. I chose two healthy entrees that I feel sure will help you with any new year's goals around healthy eating you (and I) may have. This Buddhist Noodle Bowl, above, combines silky soba noodles with a rich, salty broth, aromatic ginger and crunchy fresh vegetables. A simple and satisfying evening meal. 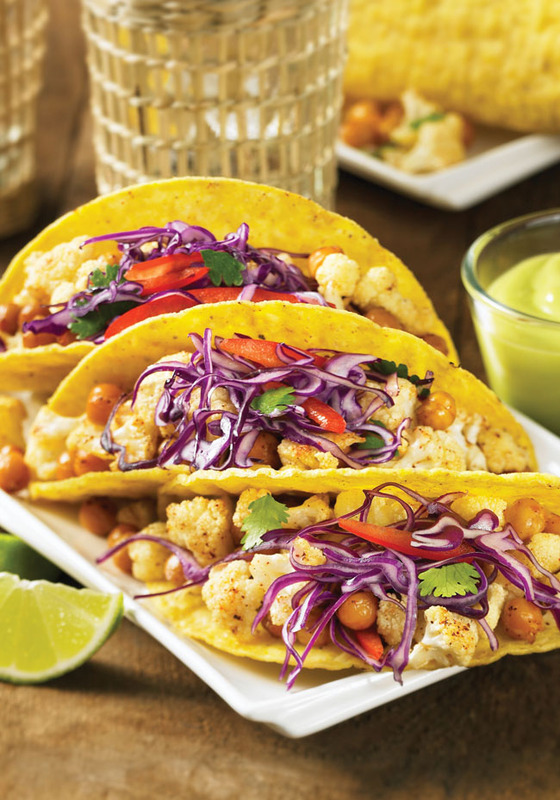 I have also included the cover recipe, because how healthy and delicious do these Roasted Cauliflower and Chickpea Tacos look? Perhaps it could be your next fave Taco Tuesday recipe! Let's jazz things up a bit okay? This new twist on traditional Mexican fare promises to add spice to your diet, along with a wide range of nutrients. 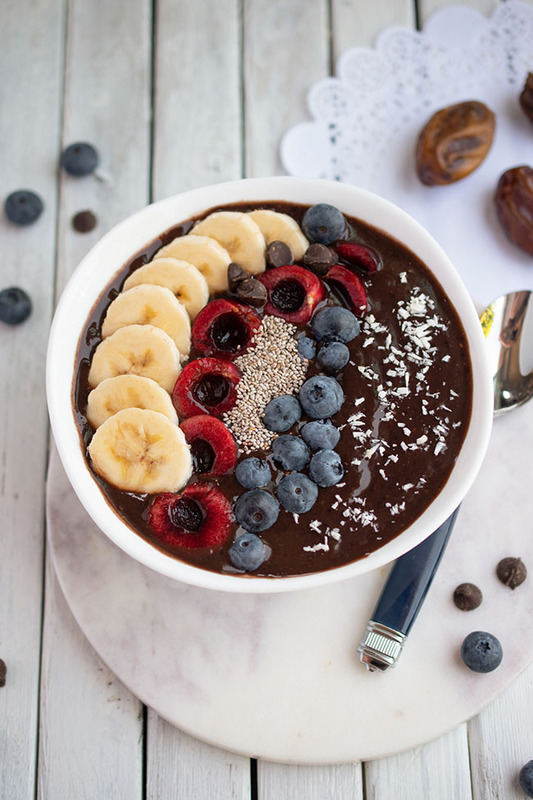 The recipes reflect creator Doug McNish's background as a chef, yet he has put the focus on ensuring they are easy to prepare and appealing to vegans and non-vegans alike. Plus they are all gluten-free! All of the recipes use clean, whole food ingredients. No refined flours or sugars are called for. "Eating vegan is easy and requires very little time," says McNish. "Cooking quinoa, rice and other legumes is usually as easy as one pot and some seasoning. Steaming or sauteing some leafy greens is no more than 10 minutes start to finish. I think the key to remember is that anything can be looked at as a lot of work if you are not enjoying it. I think that making meal prep fun and enjoyable (no matter what diet you follow) is one of the keys to success and enjoyment." Recipes I'm looking forward to trying - Moroccan-Style Collard Greens, Spinach Sauteed in White Wine and Garlic, Avocado Tempura, Coconut-Crusted Tempeh with Sweet Potato Mash, Lemon Poppyseed Muffins, Carrot Cake...I could go on and on. 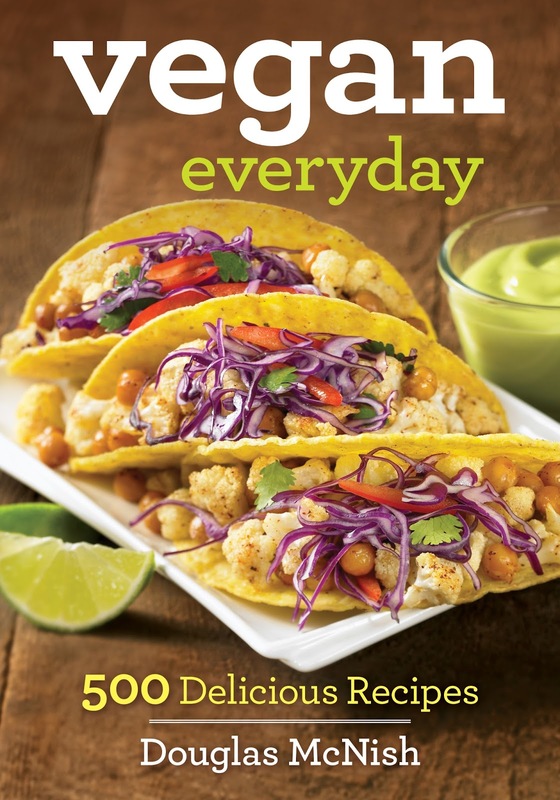 Buy Vegan Everyday: 500 Delicious Recipes in the U.S. Buy Vegan Everyday: 500 Delicious Recipes in Canada. 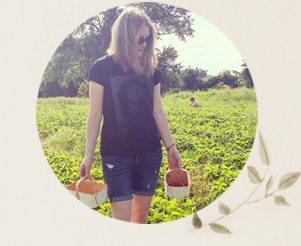 Be sure to visit Lisa, The Viet Vegan, to read her thoughts on the cookbook she has chosen for this week of Veganuary - The Rawsome Vegan Cookbook. And proceed down to the bottom of the post to enter to win a copy of Vegan Everyday! Head over to this post for two other giveaways involving tons o' vegan cookbooks, including my week one feature, How It All Vegan. You can also access those two giveaways via this post about my second week's book, Salad Samurai (which is a prize in the group giveaway). I'm also hosting a giveaway for two exciting books that are sure to whip you into shape this year. Recipes courtesy of Vegan Everyday by Doug McNish, 2015 © www.robertrose.ca Reprinted with publisher permission. Available where books are sold. Prepare baking sheet, lined with parchment paper. In a large bowl, whisk together grapeseed oil, lime juice, chili powder, cumin, salt and cayenne. Add chickpeas and cauliflower and toss well. Spread evenly over prepared baking sheet. In a large bowl, toss together cabbage, cilantro, red pepper, olive oil, lemon juice and salt. Set aside. amount of avocado drizzle. Serve with lime wedges and hot sauce on the side. Use either chickpeas you have cooked yourself or canned, preferably with no salt added. When using canned legumes that contain salt, be sure to rinse and drain them thoroughly before using. If cooking dried chickpeas, you can use your slow cooker or cook them on the stovetop. A hand-held citrus reamer can be used to extract the juice from lemons and limes. Available in most kitchen supply stores, this tool would be ideal to use for the citrus in this recipe. Choose organic taco shells to avoid GMOs, and check the label to make sure they are gluten-free and do not contain any added wheat. If you prefer, serve the Avocado Drizzle alongside. In blender, combine tamari, water, agave nectar, dulse, vinegar, ginger and mirin. Blend at high speed until smooth. Transfer to a small saucepan and bring to a boil. Cover, reduce heat to low, and simmer until ready to use. In a large saucepan of boiling water, cook noodles according to package instructions. Using a colander, drain and immediately rinse under cold running water to remove excess starch. Set drained noodles aside. In a large skillet over medium heat, heat grapeseed oil. Add ginger and cook until lightly golden, about 2 minutes. Add bok choy, mushrooms, cabbage and red pepper. Cook until soft, 2 to 3 minutes (be careful not to overcook, as you want the vegetables to retain their color). Pour noodles and broth into individual serving bowls. 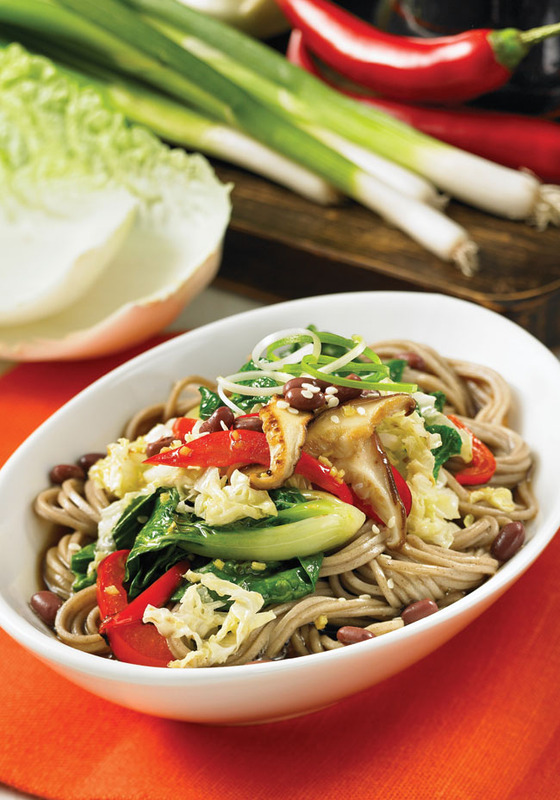 Top with sautéed vegetables, beans, green onion, sesame seeds and a drizzle of sesame oil, divided equally. Serve immediately. 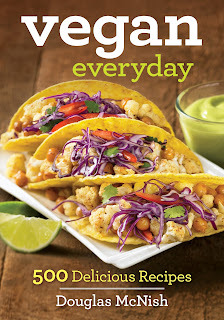 Enter To Win A Copy of Vegan Everyday! Residents of the U.S. and Canada may enter to win a copy of Vegan Everyday using the rafflecopter below until February 8th. i love cookbooks! and I would love to add more vegetarian options into my family's meal plan :D Thank you! We could use more options in our house and I love cookbooks! I want to learn more plant-based recipes. I tend to make the same ones over and over again. I heard Doug McNish on a podcast lately (speaking about veganism and faux meat) and he was so well spoken. He had a lot of interesting thoughts on how to create umami with vegan food, and he said this cookbook is filled with more tips! I would love a copy, and I heard great things about his restaurant, too. I would love to win this book to add variety to my meals. I'd love to win because it looks likes there are some tasty recipes in this cookbook! I`ve been vegetarian for 40 years but I eat too much cheese. Since this cookbook is vegan, there is no cheese and help save me from myself. I make vegetarian and vegan meals regularly and am always looking for inspiration! I simply want to learn more about choices when eatting Vegan and introduce myself to some Vegan recipes to try! I'm not vegan, but a friend of mine is vegan, so I really want to make her a bunch of food she can actually eat. I eat many vegan foods but want to get even more proficient at making them! I'm not a vegetarian or vegan but I like to eat vegan meals at least once a week and I have family members who are vegan. I'd like to win this book because I'm always looking for healthy vegan recipes. 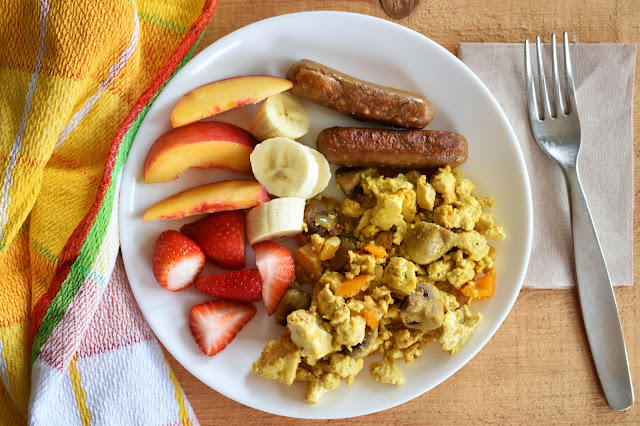 The recipes look delicious and healthy so it would be great to win it! I'd like to really take a look at some vegan recipes! great book to add to my collection! I'm looking to cut back on our meat consumption but I don't want to scrimp on taste or health. This cookbook is just what I need. Thanks for giving.